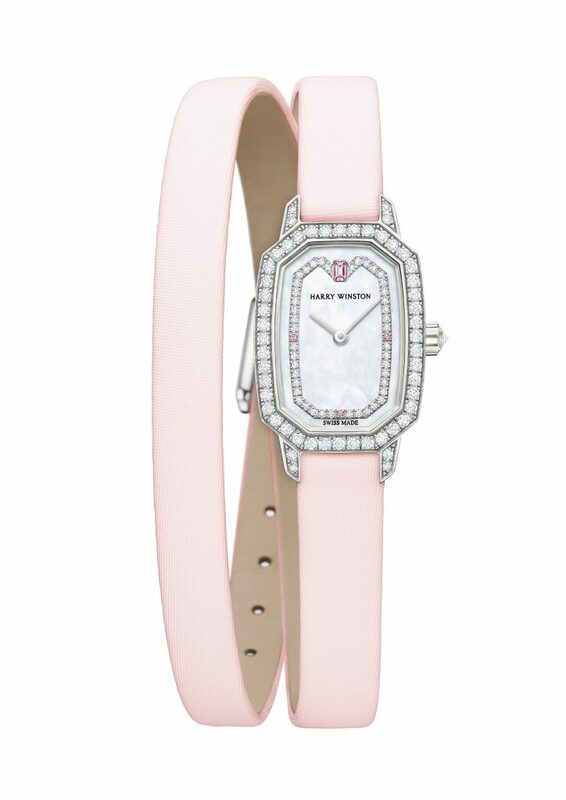 Baselworld 2018: Harry Winston Emerald Watch with diamonds, pink sapphires, pink double-wrap strap. Recently, our sister site, ATimelyPerspective.com, traveled to Switzerland to the largest luxury watch and jewelry exhibition of the year. We are lucky enough to reap the rewards, as they have scoured the show for some exclusive looks at women’s watches — and we will be bringing those to the foreground in the coming months. For now, we want to focus on a very special collection of watches, the Emerald Collection by Harry Winston, which this year has a new addition. The new Art-Deco inspired petite Harry Winston Emerald watch boasts an eight-sided cushion-cornered rectangular case that is meticulously set with diamonds. In fact, not only do the diamonds embrace the lugs and case, but also 44 brilliant-cut shimmering diamonds form a special (barely perceptible) heart motif on the mother-of-pearl dial. That motif features three small pink sapphires at the key numeral hours (3:00, 6:00, 9:00) and one larger emerald-cut sapphire at 12:00. The Harry Winston Emerald watch is powered by a quartz movement. Crafted in 18-karat white gold and powered by a quartz movement, the watch further features a sapphire crystal with anti-reflective treatment and a shimmering pale pink satin double-wrap strap with diamond-set 18-karat white gold pin buckle. While we could not understand why someone would want to wear this watch in the water, it is water resistant to 30 meters.